I learned tonight that the Looking Glass Lounge was broken into last night, July 2nd. Sometime between the time they closed and the early morning hours, a person(s) broke in through the front window which cracked but didn’t shatter. They didn’t go beyond the cash register, but did steal a television, cell phone, bottles of liquor, and cleaned out the register. It appears to have been a quick in and out since there were other items of interest that were not touched. I noticed yesterday morning that Penang was closed. It’s not someplace that I’ve eaten at a lot since its a little out of the way for me as I work on 18th and K and its on 19th and M. Still, I like the option. In looking at the permits on the door, it looks like its mostly just a major redo. So, I’m curious how long it will take to repair floors and freshen it up so that the doors can reopen. 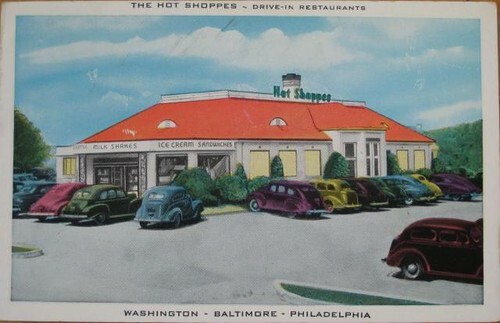 According to the Washington Business Journal, there may be new life in the former Billy Simpson’s House of Seafood and Steaks located at 3815 Georgia Avenue, NW. Eric and Ian Hilton and the team behind the tremendously popular Marvin restaurant on U Street are eyeing a parcel in Petworth to open another restaurant concept. Developer Chris Donatelli, who is working on the property along with Mosaic Urban Partners LLC, confirmed that he is in talks with the group for a new restaurant at 3815 Georgia Ave. NW. Donatelli and the city recently negotiated a land deal for the spot. This is a nice image of a time long gone. While this stretch of 19th street still supports a lot of restaurants and eateries, things have changed a bit since the mid-Twentieth century. 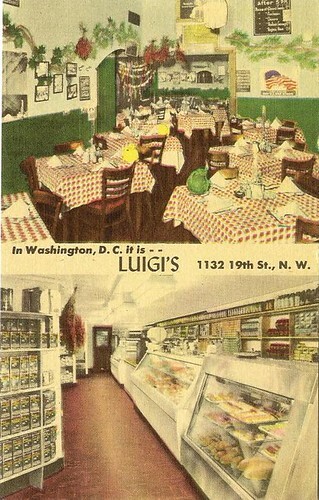 A description of Luigi’s food is below. 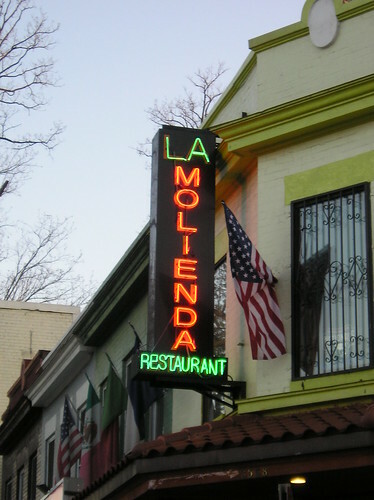 Heres a neon sign on a restaurant on 14th Street in northern Columbia Heights. I admit I haven’t had the chance to eat there yet, but it looked like something I might want to go back and check it out. May 24, 1956: A gunman’s efforts to hold up a Hot Shoppes Pantry House were thwarted when a courageous assistant manager chased the holdup man on foot, braved two shots and frightened him into discarding $200 he had stolen. Back on April 13th, I posted that Looking Glass Lounge had posted that they’d applied for a zoning change, from Restaurant to Tavern. Last night, at the Park View UNC meeting, owner Matt McGovern spoke to the residents in the neighborhood about his intentions with Looking Glass (LG). As it turns out, he doesn’t want to change much with LG. The zoning change has to do with the percentage of food vs. alcohol served. For a restaurant license, 45% of a business sales need to be in food. LG has not been able to make that quota, and apparently, neither did Temperance Hall. It was at the suggestion of the ABC that McGovern applied for the zoning change. A Tavern license has a much lower percentage of food sales per alcohol, and is well within their current business. As for the Entertainment Endorsement with Deejay, etc. … its an all or nothing deal. McGovern is exploring the feasibility of a weekend brunch and wants to have the option to have live jazz or other suitable music. He is not interested in cover charges, deejays, or dancing. They just all happen to be part and parcel with the Entertainment Endorsement. My suggestion would be to introduce yourself to McGovern next time you’re at LG if he’s around. Tell him what you like about the place, and what you would like to see. He struck me as someone that is truly interested in knowing how things are going and being a positive part of the neighborhood.